Brand24 is a fast-growing social media monitoring company. With a global presence and 60 employees, this European start-up has created one of the most popular and effective methods of monitoring and measuring the buzz around a company’s brand or product on the Internet. Two years ago, Brand24 decided to move into the U.S. and global markets. Their goal was to connect with marketers who might be interested in testing their social listening tool and provide feedback and recommendations to improve the product. But the company’s Global Communications Manager, Magdalena Urbaniak, was finding it time-consuming to perform her own research on marketing experts, journalists and bloggers in the U.S. Culling through thousands of contacts on Facebook and LinkedIn, reaching out and staying in contact while using Excel to track all of this activity was ineffective and cumbersome. Magdalena realized she needed a solution that would store all her contacts in a single repository and give her an easy way to build and manage relationships and support the company’s growth strategy. Magdalena discovered Nimble during research into possible CRM solutions. While reading blog posts about industry tools, she came across overwhelmingly positive reviews from current Nimble users. Impressed by the number of features and functionality available, Nimble stood out as the only choice for them. 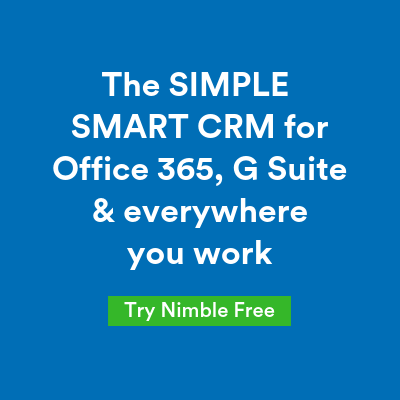 “I thought Nimble was simply about keeping contacts in order and scheduling reminders to follow-up, but the tool is so much more robust than that. There are so many things you can do, from automated data enrichment to targeted outreach to activity management”, notes Magdalena. Nimble is being used by a growing number of teams within the company for everything from influencer and social media marketing to event management and lead generation. Teams access enriched profiles with social insights, simplifying their research, auto-update records with email and Twitter communications, eliminating tedious data entry, and delivering powerful intelligence for customized outreach. Brand24 is using Nimble to scale influencer marketing and PR and communications globally. Now the team can easily track engagements with a large and growing number of contacts and connect more effectively. Using Nimble, Magdalena profiles key influencers, tracks contact activities, receives reminders to follow up, and accesses enriched profiles in her email, on social media channels such as LinkedIn and Facebook and everywhere on the web. The team enjoys easy access to team contact data and history of communications, wherever they work, making it easy to find contacts and connect within context. Building stronger relationships with customers are very important to Brand24. With the help of Nimble, the company uses a combination of video content and social insights to amplify new customer announcements in a fun and casual way. Brand24 produces a personalized welcome video for every new client, and then uses Nimble to track engagement and social preferences, allowing them to tailor their interactions with customers. Now they can ask customers to share the video with their preferred communities, expanding their reach and increasing brand awareness. 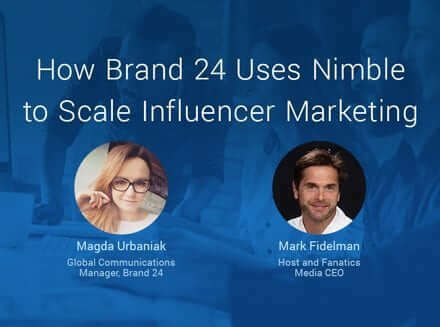 Nimble has helped Brand24 to scale influencer marketing and celebrate customer wins. As a result, the company has signed approximately 200 clients per month and seen customer satisfaction scores increase significantly. Magdalena looks forward to using the additional features of Nimble to expand their influencer marketing and lead generation efforts in the near future. 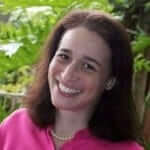 “I love Nimble’s friendly user interface and features. It looks like someone really took the time and effort to step into my shoes as a communications professional and understand my needs to develop a solution that helps me do my job more effectively and efficiently. Nimble is very intuitive, simple to use, and gives us so much useful data. We’re excited to increase our use of Nimble to help us improve our prospecting and relationship management efforts,” concludes Magdalena.